This is the basic process I go through when I construct a pouch sheath. In the future I hope to add photos to make this more of a tutorial, but for now I am posting this written process for people who might be interested. This description does assume you have a basic understanding of leatherworking and sheath terminology, but feel free to contact me any questions if you are confused or you think something needs clarification. Draw up a pattern of the sheath and belt loop on light poster-board stock. I like to use old manila folders. I currently have a large box full of folders thrown out by a high-school after the tabs got used up and bent over; a lifetime supply of pattern material. Draw only the front part of the sheath to scale, leaving plenty on the back side to be cut to fit (but lightly outline what the back part of the sheath should look like). Place the patterns on the leather (in efficient locations) and trace the outlines of the patterns with a pen. Cut the welt section out of the cardboard pattern and trace that onto the leather. Trace the welt a little wider toward the outside of the sheath to leave room for possible adjustment later when assembling the sheath. Using a sharp knife, cut out the pieces of the sheath. Moisten the leather by dunking it quickly in warm water. Fold the pouch piece and check the rough fit with the knife (include the welt). Make sure the knife is wrapped in saran wrap to protect it from the moisture of the leather. Lightly work the moist leather around the ricosso and guard area with clean fingers, being careful onto mark the leather with your fingernails, but leave most of this for later. When everything looks about right, gently flatten the pouch and let it dry. Sand the mouth and edge of the front part of the pouch with a rough belt on a belt sander, being careful not to burn the leather. If you plan to do any decorative stamping or carving, moisten the surface of the pouch with a sponge dipped in warm water and complete all stamping, decorations, etc. on the front of the sheath and around the mouth. Moisten the entire pouch by dunking it in warm water, fold it over and recheck the fit with the welt and knife (wrapped in saran-wrap), using bulldog clamps if necessary. Wet-form the leather around the knife handle and guard. If more welts are needed, cut and skive them. Once the fit looks good and feels right, set the pouch aside to dry. If you are using a built-up welt of several pieces, glue all pieces of the welt together as a unit. Put the longest piece of the welt in the center and stack shorter pieces on top of or underneath it, if needed. The shorter additional welt pieces can be skived so they are angled and thicker toward the knife guard or handle but thinner toward the outside of the sheath. This way the welts will allow the leather to follow the natural curve of the sheath as it wraps around the guard and handle and is stitched at the edge. It will also keep the guard and handle from pulling the front and back panels of the sheath apart from the welt, exposing the stitch threads to the sharp edge of the knife. Cut/sand the end of the welt at the mouth of the sheath with a rounded edge so the knife has a smoother entry into the pouch. Cut off enough of the other end of the welt so a drain hole will exist at the tip of the sheath when it is folded over and stitched. Position the welt on the inside of the front of the pouch and check the fit with the knife. When the welt is properly located, remove it, rough up the contact areas, apply leather cement, let dry, press together, pound and clamp the welt to inside of pouch front, let dry. Check knife fit again with the knife in the sheath while positioning the back piece of the pouch on the welt. When fit is good and snug, but not too tight, mark the location of welt edge on the inside of the back of pouch (ie, on the extra leather that was left on back part of pouch way back when the sheath was first traced onto the leather). Position the belt loop on the back of the sheath, checking the angle of the fold so the sheath will be at the desired angle when carried, etc. and check to make sure that when the loop is stitched, the stitching that will later hold the sheath closed (and the welt in) will not be too close to the stitching that will hold the loop (i.e., allow enough space between the loop location and the edge of the pouch to allow for this stitching later). When it looks good, lightly trace into the leather the outline with a tool or dull pencil. Set the pouch part of the sheath aside. Sand the belt loop edges if they need any cleaning up and then skive the parts that meet the sheath. Stamp your initials/logo into loop. Alternatively, your logo may be stamped into the lower part of the back of the sheath below the belt loop. Make all stitch grooves on lower and upper part of loop and any decorative stamping (ie: decorative side grooves on part of the loop that shows, etc). Edge-bevel the loop making sure to not bevel the areas that contact the pouch. Edge-Kote the edges of the loop. Coat the edges of the loop with Gum-Tragacanth and let it dry; then burnish. Mark stitch holes in the loop with a stitch wheel and punch stitch holes with awl. Position the loop on the previously marked spot on the back of the sheath to check the location. Rough up the areas of both the loop and the sheath where they will meet and then apply contact-cement with a toothpick or similar small applicator, taking great care to insure no cement will show once the loop is in place (NOTE: glue does not need to come to the very edge of where the loop and sheath meet, just very close) . Let glue dry aprox. 10 min. When the glue is dry, press the loop and sheath together. Pound these areas lightly with a smooth-faced mallet to insure good glue up, and let dry. Fold the lower part of the loop up and punch the upper stitch holes in the sheath by pushing the awl through holes already punched through the upper part of the loop. On the inside of the sheath, connect the stitch holes with a shallow cut with the stitch-groover or swivel-knife. Make the groove where the stitch will be backstitched slightly deeper. Proceed to saddle-stitch, back-stitching 2-3 stitches at start and finish and lock stitching at end of stitch. Use heavy thread when stitching the loop, seven strand. Position the lower part of the loop and check fold angle again. Repeat the above steps completed for the upper part of the loop. Check the fit with the knife for snugness again. When the fit is good, re-mark the location of the welt on the back of the pouch if necessary. Rough up, glue, etc. the back part of the sheath to the welt. Pound the glued area from the back of the sheath and clamp it up with spring clamps to insure proper glue-up. When applying glue to the welt area it is OK to spread it a little wide to make sure the welt is well glued to the sheath. Cut off excess leather on back of pouch, following profile created by welt and front of pouch. Do the same for the back part of the mouth. Complete most of rough sanding of edge (welt) and mouth. Edge bevel the mouth. Moisten front of pouch and make stitch groove, if not already completed. Mark stitch holes and punch them with awl in the drill press rotating at slowest speed, carefully watching angle of awl hole. After moistening the back of the sheath, connect the stitch holes with a groove on backside of sheath. First make a groove impression with a tool, then cut a groove with the stitch-grooving tool. Cut the groove a little deeper at the beginning and end where backstitching will be completed, and cut a groove on the front side only where the backstitch will occur. Saddle-stitch the edge; back stitching at mouth and tip to reinforce these areas, starting stitch at mouth and lockstitching at the end for 2-3 stitches. Use the awl blade or other tool to work the stitch hole slightly wider so the needle and thread will go through easier for the lockstitch. Pound all stitches from the back with a mallet. Do any final sanding, then edge bevel side with welt and clean up any areas around mouth. Edge-Kote all the edges and add some Gum-Tragacanth, let dry, and burnish. Test the fit with the knife. Re-moisten sheath and form fit if needed. Warm the sheath in oven at aprox. 180 degrees F and coat it with warmed waterproofing treatment. Repeat 2-3 times. Wipe off any excess if it stops soaking in. Let dry. Admire your accomplishment and go show someone who might also appreciate it. What weight of leather should be used? 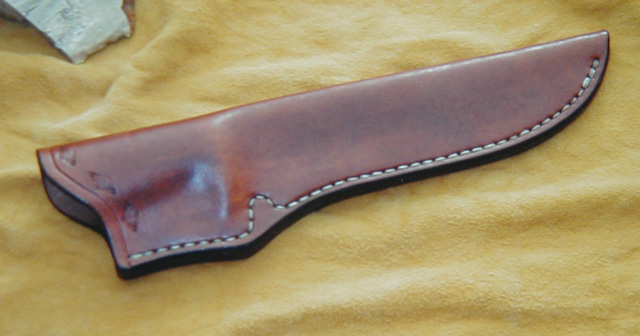 I prefer 8/9 oz vegetable tanned leather for most sheaths. For large knives you may need a heavier weight, but 8/9 works for all of my needs.